Don't you think that would be a great show idea? Segway Cops! Chasing the bad guys down the streat, guns blazing, swear words being thrown everywhere and the cops on Segways! Where's my television contract? Anyone want to licence it from me? 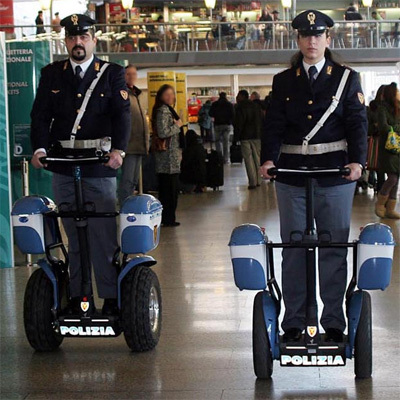 Actually just for fun I typed Segway into Google Image search and discovered that the Italian Police Force actually use Segways! I'm sure having people on Segways is much better than having them on smoke spewing petrol motorbikes too. You can read more on the official Italian Police Force website. Older post → New Hang Seng and Singapore Straits Times Records!